This chapter will consider normal development, functional adaptations at birth, and abnormal development. Liver and gallbladder anomalies are sometimes accompanied by abnormalities in other systems or seen as part of a fibrocystic syndrome/ciliopathy. In neonatal cholestasis, or liver failure, the liver may be biopsied. Biopsy rates in these settings vary between centers. Gene chip analysis can be performed on peripheral blood, for conditions with known genetic mutations, and biopsy is regarded by some as a “third-line” investigation in biliary atresia. Despite this, there will always be cases where biopsy is a key contributor to the multidisciplinary diagnosis of neonatal liver disease. An approach to the interpretation of patterns of liver disease, representing common diagnoses, in this age group, is presented in the settings of neonatal jaundice and liver failure. Trauma and iatrogenic causes of liver disease are considered. Intestinal failure-associated liver disease is an example of the pathologist’s role in the timing and appropriateness of transplantation, by staging liver disease and excluding additional diseases or systemic conditions. Examination of the explanted organ confirms disease processes, important in follow-up for potentially recurrent conditions. 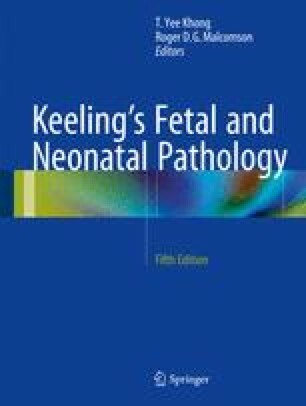 Finally, the fetal and neonatal liver can be the site of tumor formation. Salient features of these are described.